A Triumphal Arch, a bedroom celebrating the victories of Admiral Lord Rodney and Capability Brown-designed gardens make Berrington Hall a top place to visit in Herefordshire. 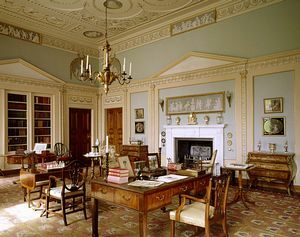 Thomas Harley had made a sizeable fortune supplying the British Army and when he decided he needed a new family home in keeping with his status, he called upon Henry Holland to design it for him. Lancelot Capability Brown helped Harley select the perfect location for his dream estate which still has sweeping views across to the Brecon Beacons in Wales. 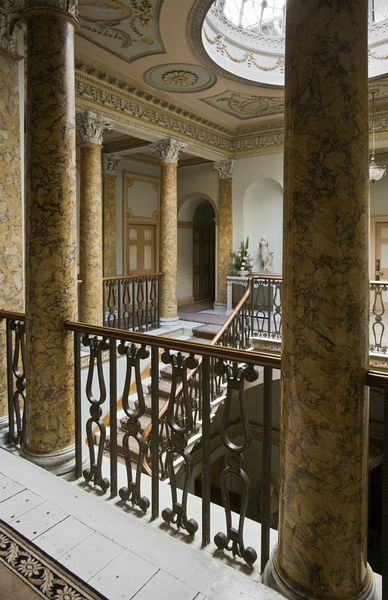 The final result was this impressive neo-classical mansion with equally stunning interiors, set amidst some of Capability Brown's loveliest landscaping, which were also his last major commission. with its oversized Ionic columned portico hides a multitude of treasures within. Ornate plasterwork, painted ceilings, a dome-lit staircase and ornate state rooms contrast with the servant's quarters. The rooms are cleverly designed so that the staff could flit from room to room almost unseen. On a more down-to-earth note, visit the Butler's Pantry, the Laundry and the Dairy as part of your tour. Tucked out of sight in the gardens is a drying area, so that nothing as mundane as laundry may be seen from the house as a blot on the landscape. Naval hero, Admiral Lord Rodney was a friend of the family and frequently visited Berrington Hall. He eventually married Anne, Thomas Harley's daughter. 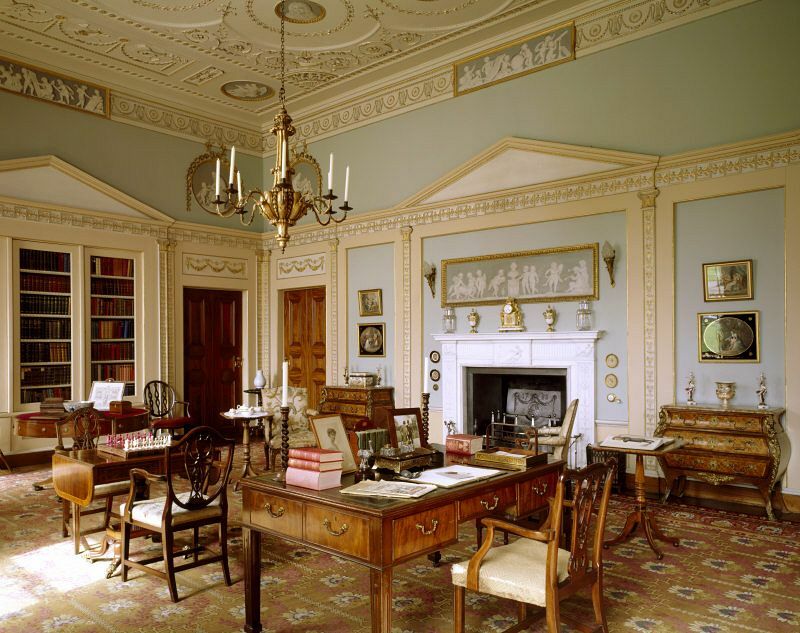 A tour of the house will reveal the gossip about Lady Rodney along with some of her personal belongings and her diary detailing her life and secrets. The Rodney family lived in Berrington Hall for 95 years until George, the 7th Lord Rodney, gambled away the assets and was forced to sell it in 1901. Fortunately the wonderful collection of naval artworks by Luny and the dress uniforms of the first Admiral remained and are on display in his private apartment. National Trust in 1957. 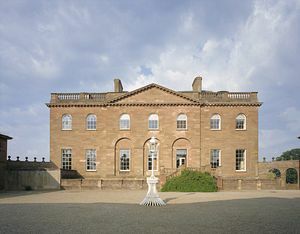 The last member of the Cawley family to live at Berrington Hall was Lady Cawley, who died in 1978 at the grand age of 100. The fabulous Elmar Digby furniture collection which was bequeathed to the National Trust in 1981 was used to furnish Berrington Hall with 18th century French furniture, clocks and works of art worthy of this fabulous stately home. There is also a collection of costumes on loan from the Charles Wade Collection which is perfectly in keeping with the grandeur and history of this elegant mansion. The 14-acre Berrington Lake was dug by hand and is the centrepiece of these landscaped acres. The carefully arranged specimen trees and shrubs create a pastoral landscape which looks totally natural, just as Capability Brown intended. Berrington Hall also has a collection of local apple trees in the walled garden and there is a heronry which is a Site of Special Scientific Interest. The woodland garden has a wonderful collection of azaleas and rhododendrons which put on a dazzling display in late spring. The gardens also include a Triumphal Arch which draws the eye and is actually a small self-contained lodge which can be rented, along with its own private garden, for those who want to enjoy a taste of life at this splendid estate. Lugg Valley 492 Ludlow-Hereford (passing close Ludlow and Leominster), alight Luston, 2 miles. 3 miles north of Leominster, 7 miles south of Ludlow on west side of A49.